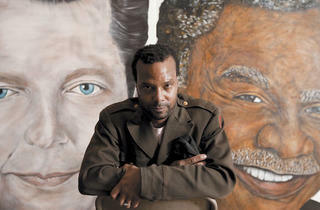 The Flat Iron Building stalwart shows his “Portraits of an Idol” at the Silver Room. With his wide, glassy eyes, sweaty brow, high-pitched titter and unbridled discursiveness, Jeffrey Reid frequently comes off like a man who just walked out of the desert claiming he’s seen God. Other times, the 51-year-old artist is remarkably coherent discussing his middle-class New York upbringing; his former Wicker Park café, Yo Mama’s; his short stint in the Air Force (he was honorably discharged after one month); and, of course, his paintings. We met up with the Flat Iron Building stalwart to discuss his exhibit “Portraits of an Idol”. 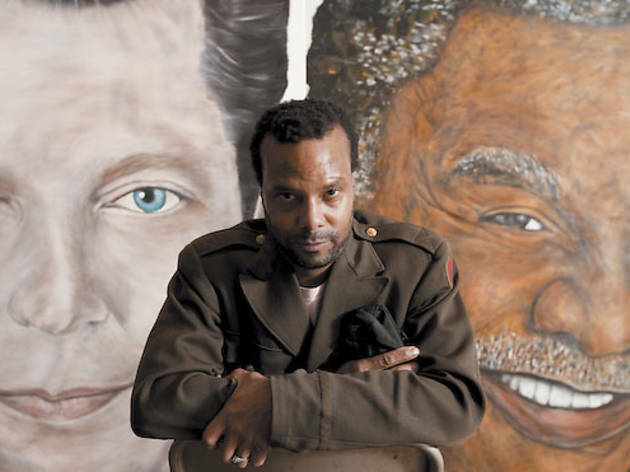 Reid’s large-scale likenesses of luminaries from Oprah to Michael Jordan to Harold Washington are on view—and on sale for $10,000–$30,000—through October 27 at the Silver Room (1442 North Milwaukee Ave, 773-278-7130). I realized I couldn’t get paid to paint nudes! [Laughs] My female friends will sometimes come over and pose naked holding guns for my Armageddon series. But you’re painting some of the most recognizable faces in history, some in poses we’ve seen thousands of times: Einstein with his tongue out, Malcolm X with his fist up. What do you achieve by doing figurative paintings of them? Remember Saddam Hussein? There were posters of him everywhere in Iraq, big posters like these paintings. So I wanted to advertise the good people of the Earth in the same way, and say, This is the way, this is how we should be. Each portrait is seven feet tall, five feet wide. Do you see each person as equal? They’re equal in being human, but there are different levels of their excellence. They’re not necessarily all my idols, but I do consider them something to strive for in my own daily, weekly, monthly, yearly, decade, century, eon—until the end or the beginning. Like, I would much rather be Mayor Washington than Fred. Yeah. He was a slave! Who I most want to be is Barry. No, Barry Manilow. He’s the most powerful person on Earth—and he’s a black male! I used to live at 53rd and Cornell, down the street from him. You describe your happy scenes of the Obama family as “uncommon” sights. They’re smiling and they’ve got all their teeth—it’s uncommon to see a happy, together black home. He obviously isn’t black. He’s white as snow. But when there are shootings on the South and West Sides, he marches for those people! It doesn’t take skin color to be of the spirit of a black person.